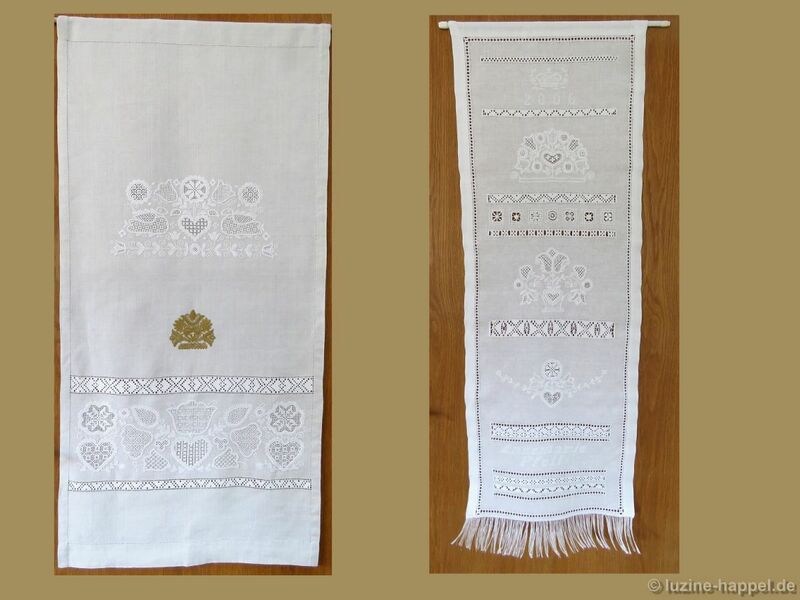 Both samplers show needle-weaving bands, whitework designs, and crowns. 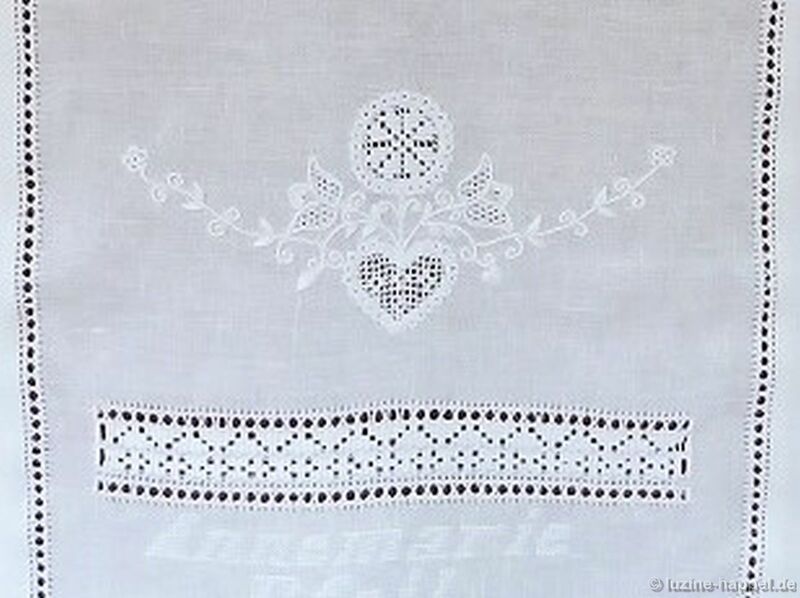 Yet the appearance of both is very different. 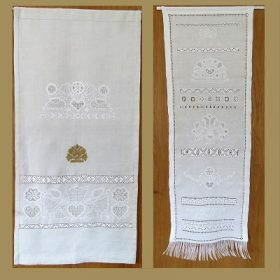 A novice to Schwalm whitework worked the example on the right in 2006. 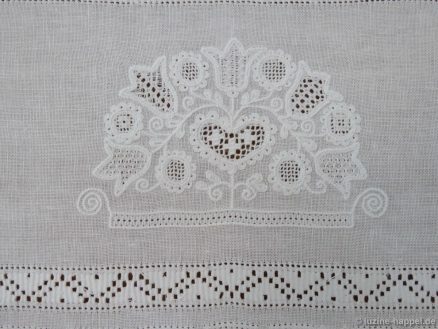 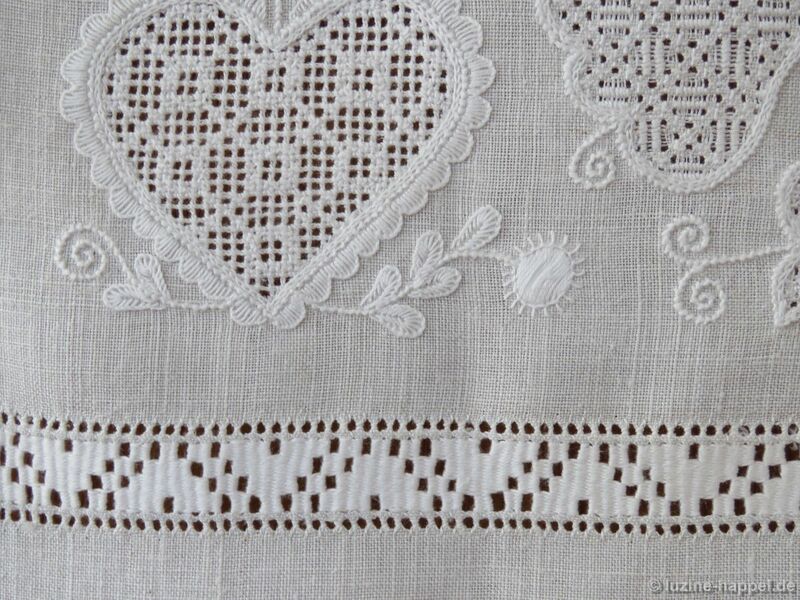 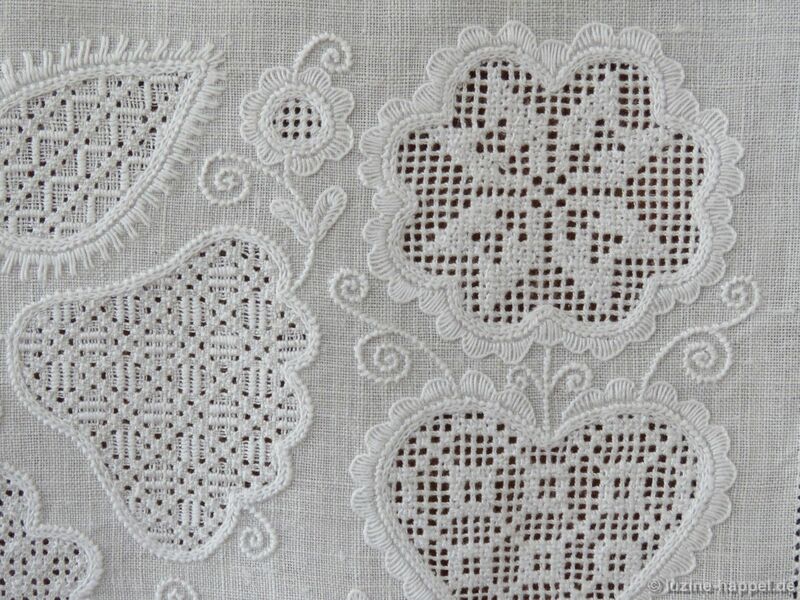 She separated small whitework designs with needle-weaving hems. 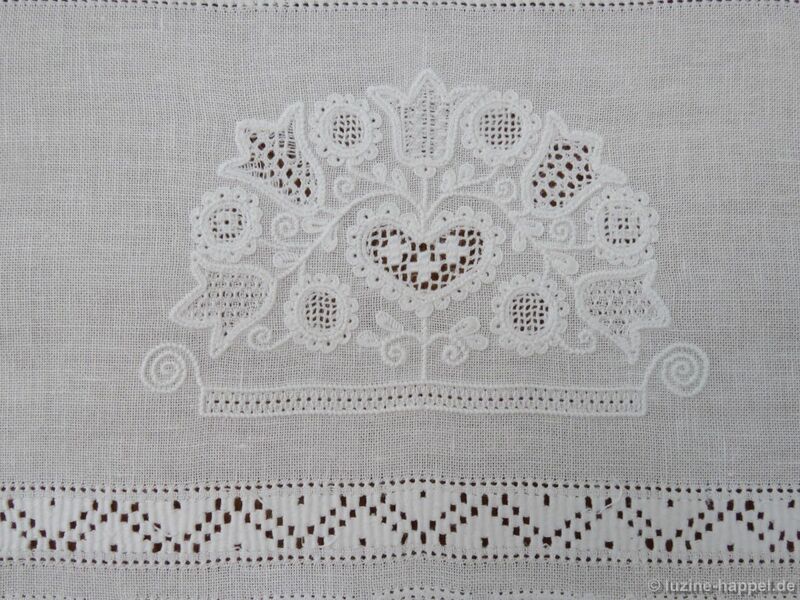 one more fancy design, and one design with a flower basket. 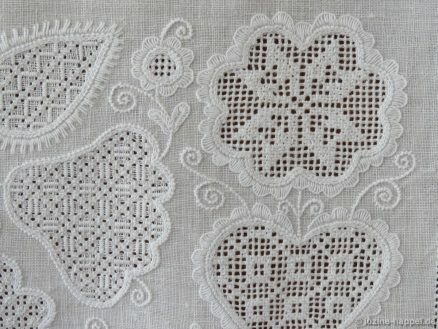 In relation to the thread count of the linen, her designs had small shapes. 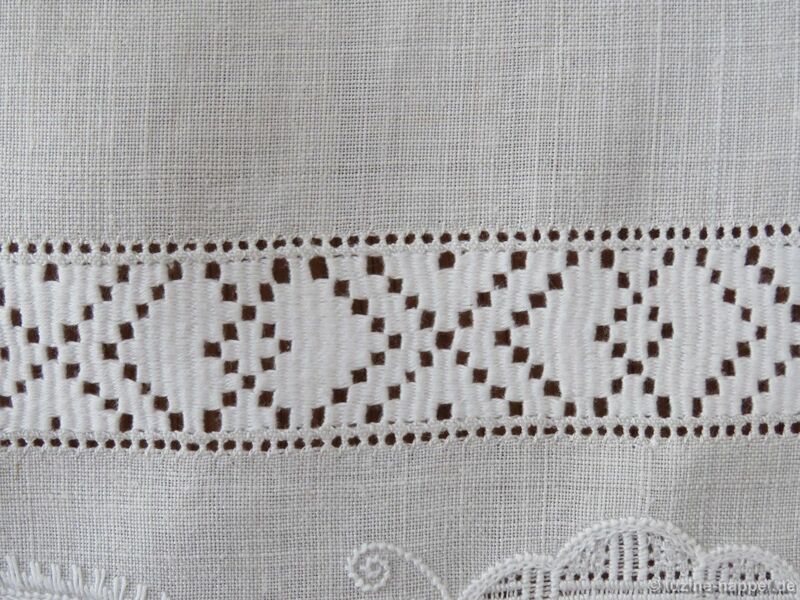 It is difficult to find different matching filling patterns for small areas. 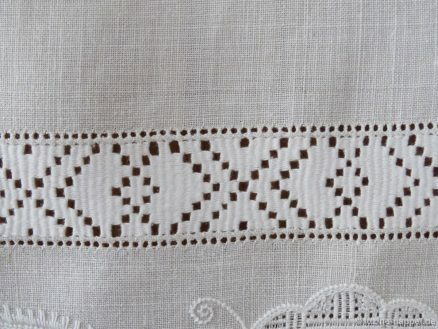 She added squares showing different corner solutions. 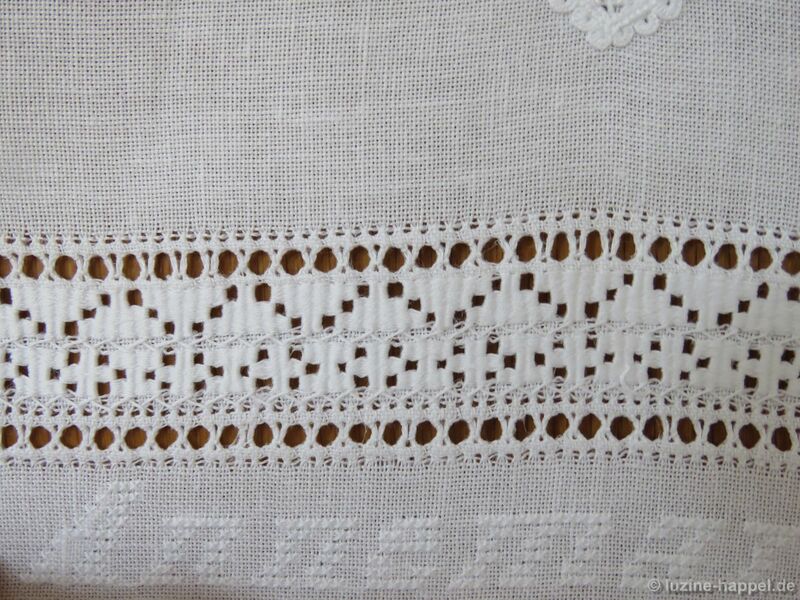 with Peaholes and Herringbone stitches. 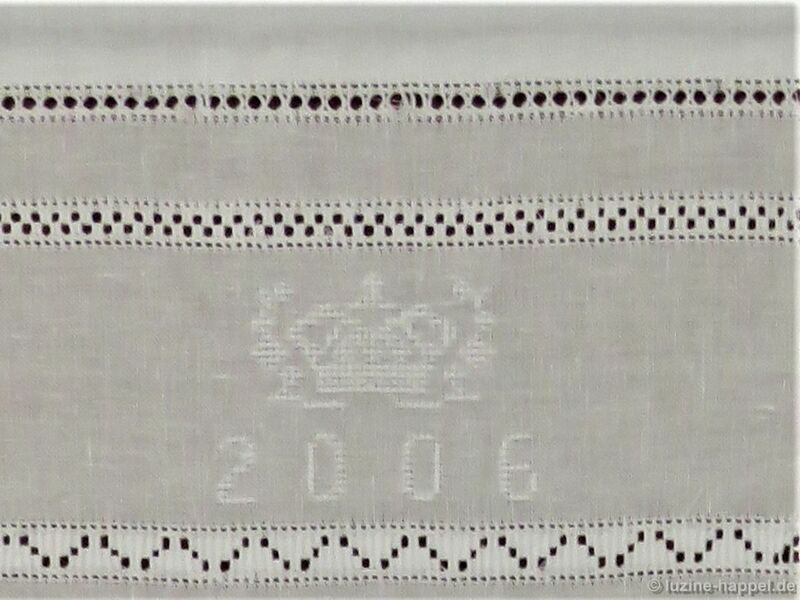 She added her name at the bottom and a crown along with the year in white Cross stitches at the top. 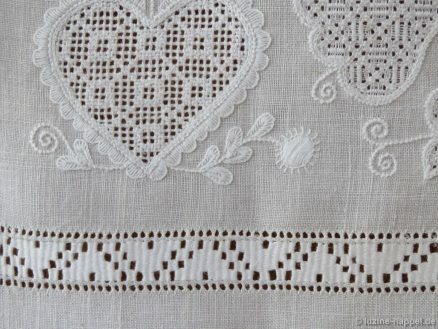 The piece was hemmed with a Peahole hem and frayed at the bottom edge. 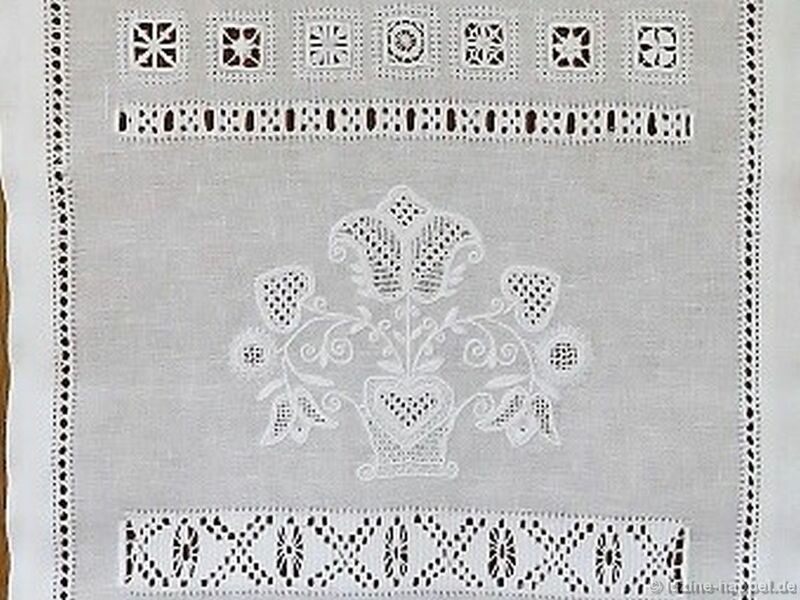 She learned all the basic stitches common to Schwalm whitework creating her own unique sampler wall hanging. 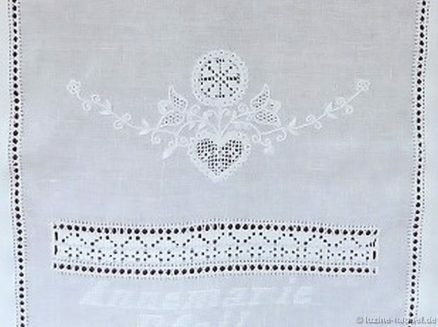 Now – 12 years later – she told me that her skills are undeniably improved. 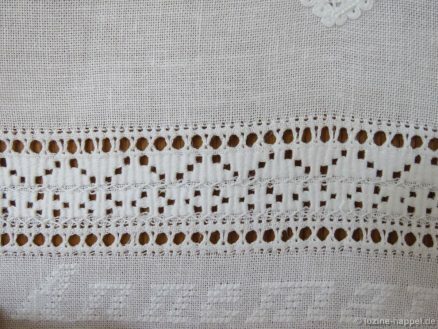 Errors like too loosely bundling together the Peaholes or combining needle-weaving patterns with different non-matching pattern segments no longer happen. 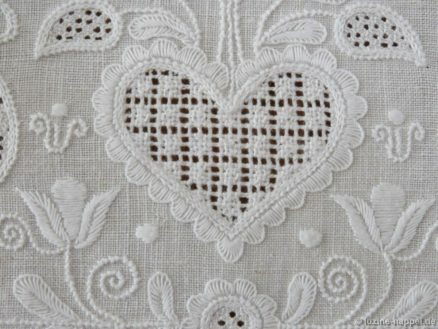 But it was her first piece; she learned a lot, and she is proud of it. 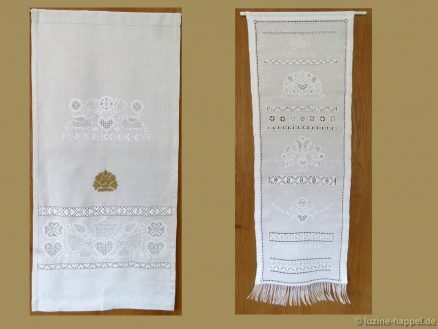 A more experienced embroiderer worked the example on the left in 2014. 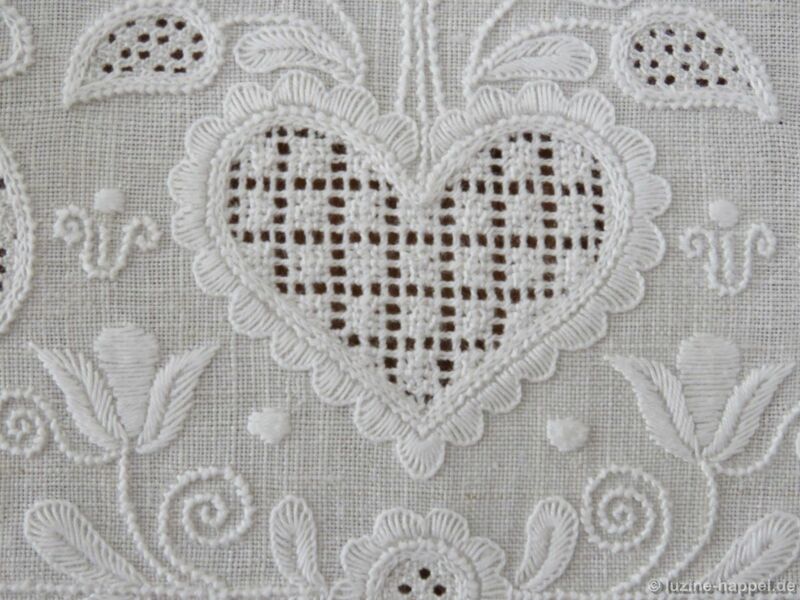 It is divided into three parts. 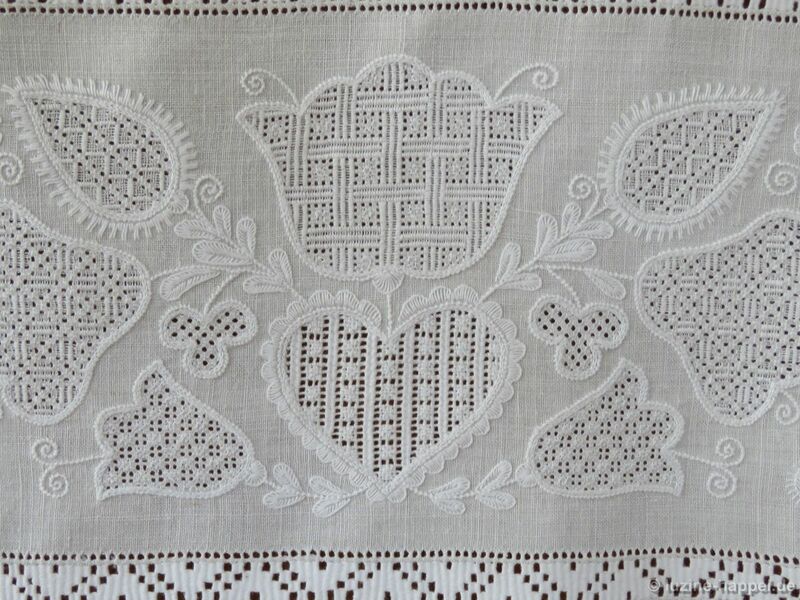 The bottom section shows a typical Schwalm whitework design with hearts, tulips, buds, and clover leaf motifs bordered with needle-weaving bands. 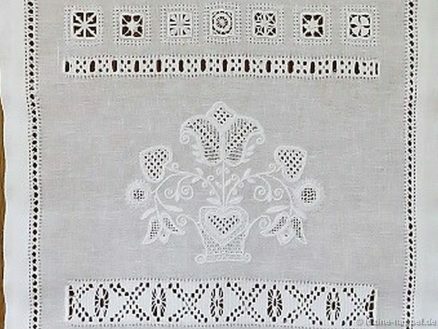 As clearly seen, most of the motifs are distinctly larger than the motifs on the hanging to the right. 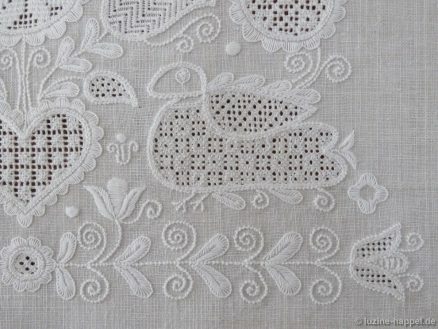 This made embroidering different filling patterns much easier. 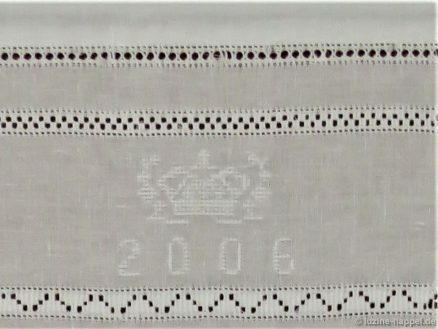 On top of the whitework border, a Satin stitch crown was placed. 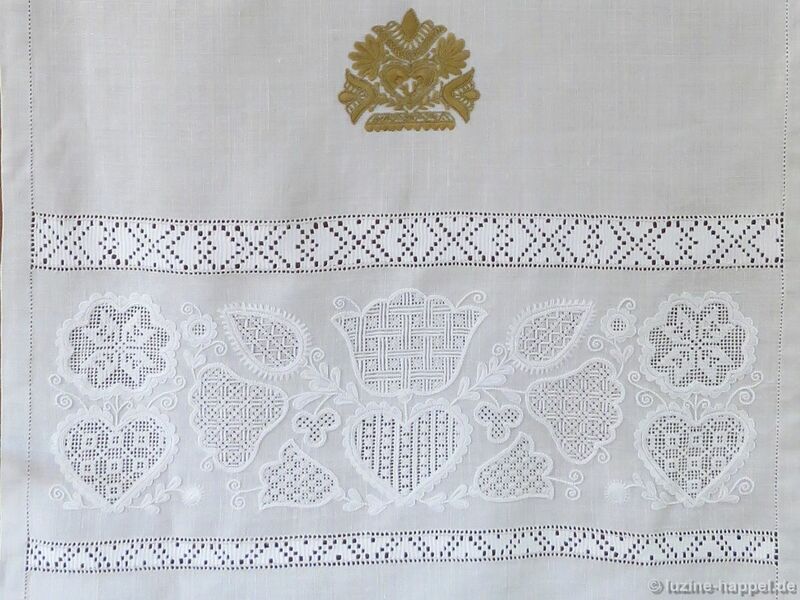 Above the crown a whitework design in the shape of a crown was embroidered. 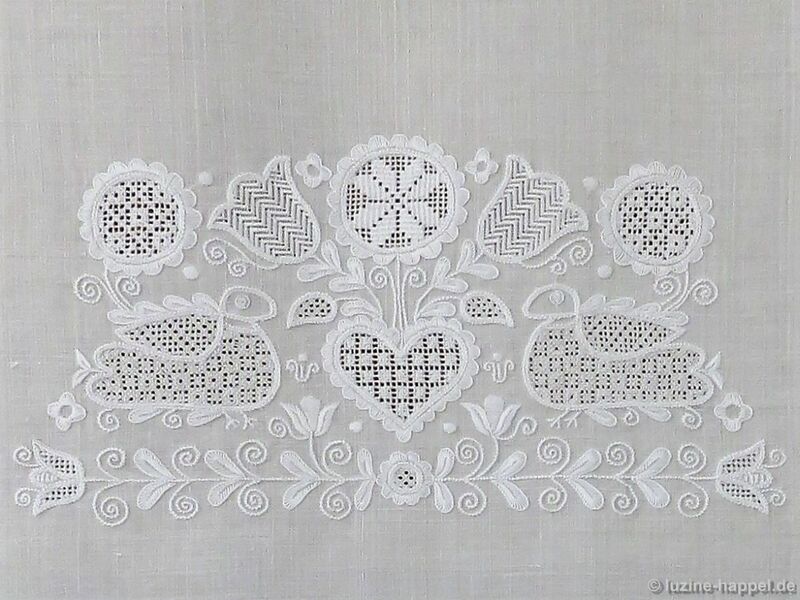 We can see heart, tulip, bud, circle, and bird motifs. 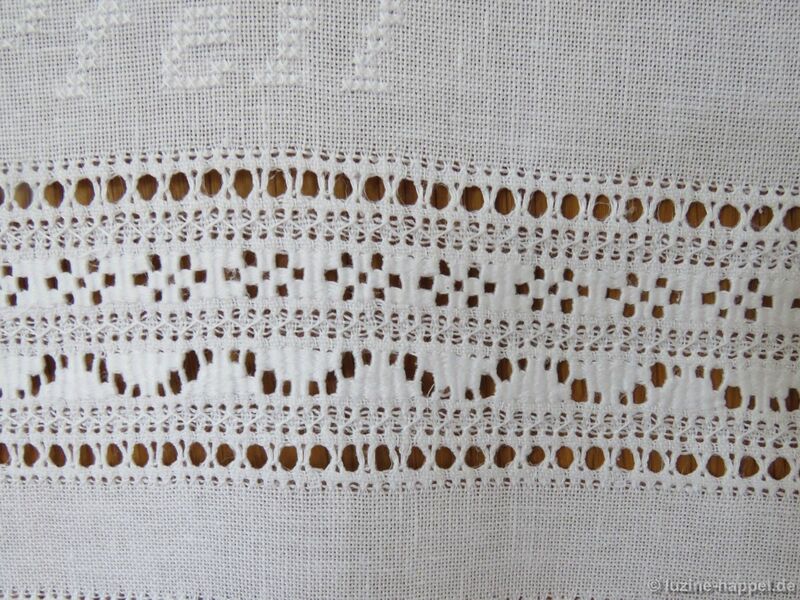 Openwork fillings are mainly Limet filling patterns. 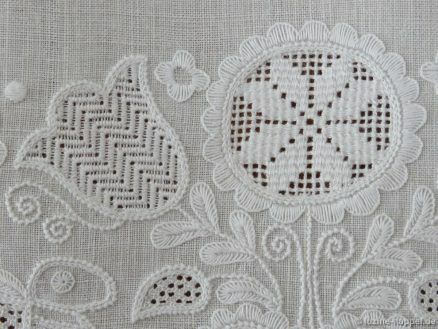 Blanket stitch scallops, Eyelash stitches, and 2 short-2 long for outlining motifs, rounded leaves, Blanket stitch eyelets, Satin stitch elements, and many distinctive tendrils have been worked. 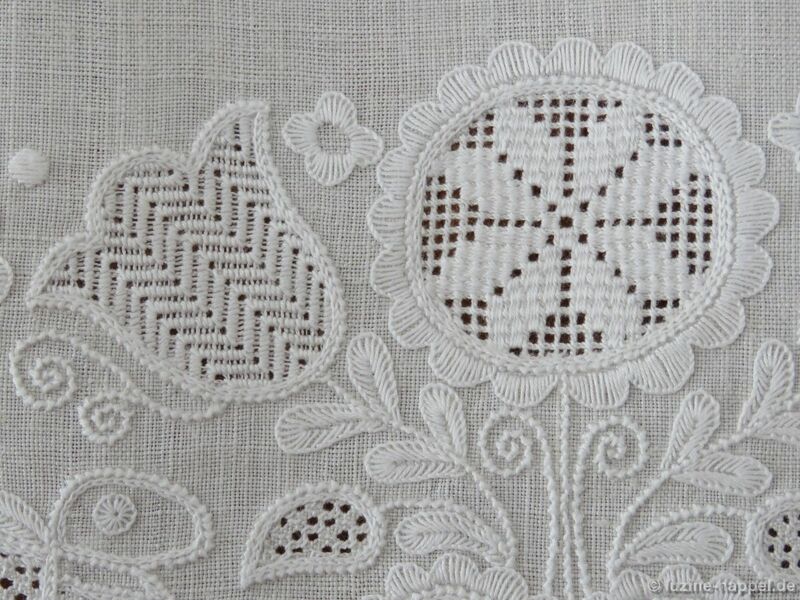 The embroiderer has achieved a balance between motif shapes and surface embroidery. 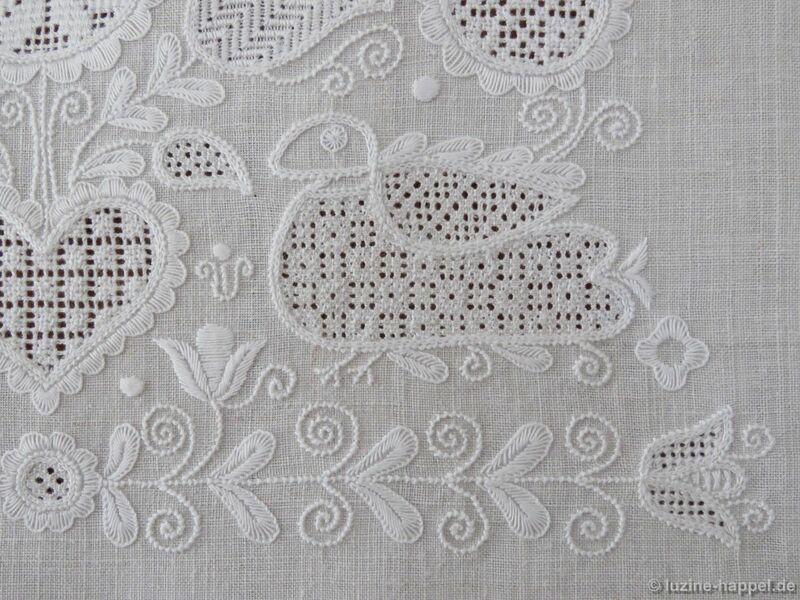 The filling patterns are perfectly chosen to match the respective shapes. 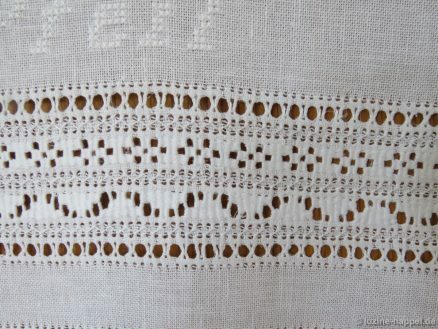 Also figured patterns like stars are worked. 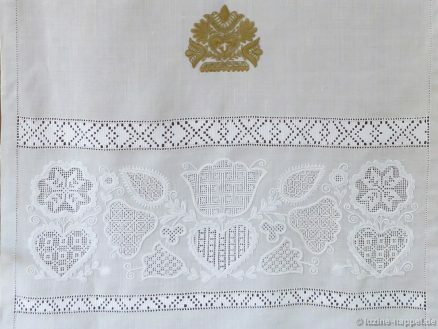 A clear and orderly appearance has been established. 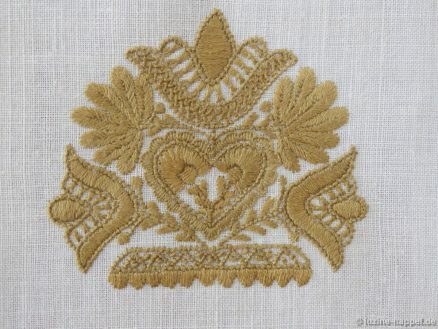 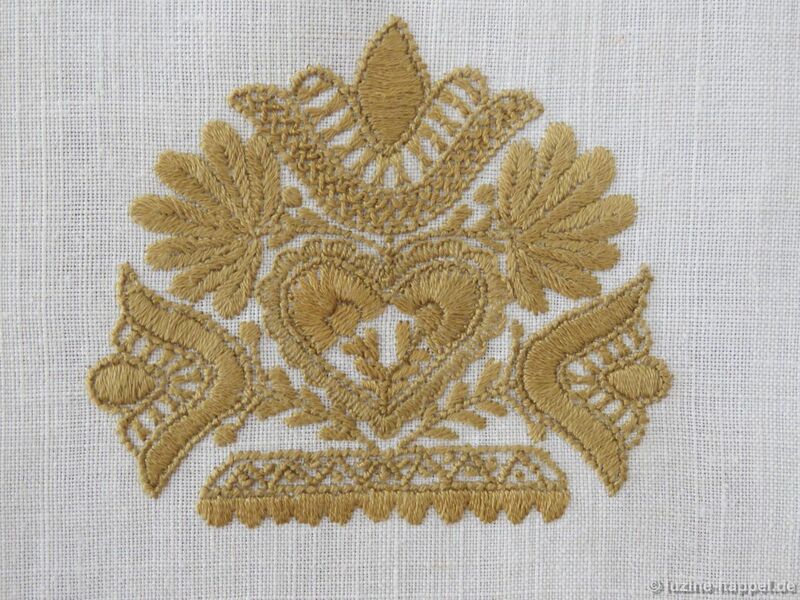 A golden Satin stitch crown tops off this special whitework sampler piece. 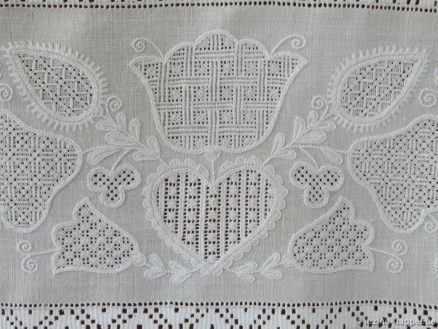 Did you notice that in all eighteen different filling patterns were worked in addition to all the various surface embroidery? 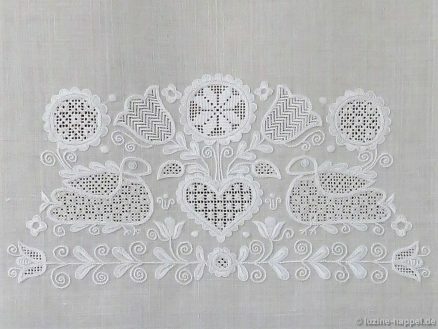 I hope you have enjoyed looking at another beautiful example of the richly diverse Schwalm whitework technique.